The following is an appeal issued by the Partnership for Civil Justice Fund, a law firm dedicated to defending democracy and civil rights in the courts and in the streets with a long history of victories in the legal arena. 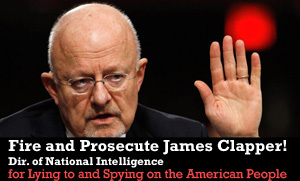 The ANSWER Coalition urges all our supporters to sign the petition to fire and prosecute Director of National Intelligence James Clapper. James Clapper, the Director of National Intelligence, should be immediately fired and indicted for committing perjury. Clapper has admitted now, and only after whistleblower Edward Snowden courageously revealed the truth, that he did not tell the truth in his sworn testimony before Congress on March 12, 2013. “Does the NSA collect any type of data at all on millions or hundreds of millions of Americans?” asked Senator Ron Wyden when Clapper gave his sworn testimony. Perjury is a serious offense. Neither Clapper nor any other high government official is above the law. The U.S. Constitution requires removal of any civil officer guilty of “high crimes and misdemeanors” such as perjury. Clapper’s crime was more than mere perjury. His crime is an abuse of office, a public corruption, an offense against society and democracy. The government wants to put Snowden behind bars for the rest of his life while the officials who lie to Congress and operate mass spying programs on the American people remain on their job. That’s an outrage. It is wrong and it is illegal. I am joining with people all over the country to demand that James Clapper be fired immediately and indicted for perjury.